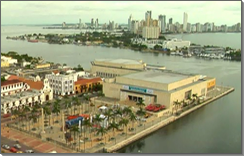 The tenth meeting of the Conference of the Parties to the Basel Convention was held at the Cartagena de Indias Convention Centre (CCCI) in the majestic city of Cartagena de Indias, Colombia. Theme of the tenth meeting of the Conference of the Parties to the Basel Convention was “Prevention, minimization and recovery of wastes”. The meeting opened at 10 a.m. on Monday, 17 October, and concluded on Friday, 21 October 2011. The English Advance of the report of the 10th meeting of the Conference of the Parties is now available in Word and PDF. The final report of the 10th meeting of the Conference of the Parties is now available in all languages. Please visit the meeting documents page to access the report. Geneva (25 October 2011) – Representatives of 118 members of the Basel Convention, the global treaty on waste management, have reached a historic agreement unblocking an amendment that will ban the export of hazardous wastes from OECD to non-OECD countries, known as the Ban Amendment. The groundbreaking decision, containing a set of measures aimed at strengthening international control of transboundary movements of hazardous wastes, was adopted on 21 October, the closing day of the 10th meeting of the Parties to the Convention (COP10), in Cartagena de Indias, Colombia. The ground for the breakthrough was prepared by the Country Led Initiative (CLI) to Improve the Effectiveness of the Basel Convention, initiated by the Governments of Indonesia and Switzerland at the last Conference in 2008. The effort was supported by the Government of Colombia, host of the Conference. The so-called CLI decision allows the Ban Amendment to come into force for those countries who wish to adhere to it, but also moves forward in establishing a regime for countries who wish to trade in waste to ensure the minimization of health and environmental impacts, ensuring adequate social and labour conditions and creating new economic opportunities. It clarifies the interpretation of Article 17(5) of the Convention, setting the bar for entry into force of the Ban Amendment. The amendment will enter force once an additional 17 parties ratify it. 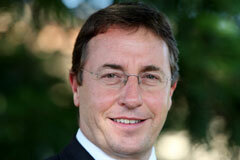 “The results of the Cartagena conference offer a concrete example of how transformative environmental action can serve to reduce poverty and promote a healthy environment and social equity, advancing the promise of a green, sustainable economy which will be the focus of the Rio+20 conference next year,” said UN Under-Secretary General and UNEP Executive Director Achim Steiner. "All too often UN negotiations can be characterized by frustration and stalemate. The Cartagena meeting provides an antidote to such perceptions and bodes well for the next round of discussions on the way forwards towards an ambitious mercury treaty that reconvene at UNEP headquarters in Nairobi next week," he added. 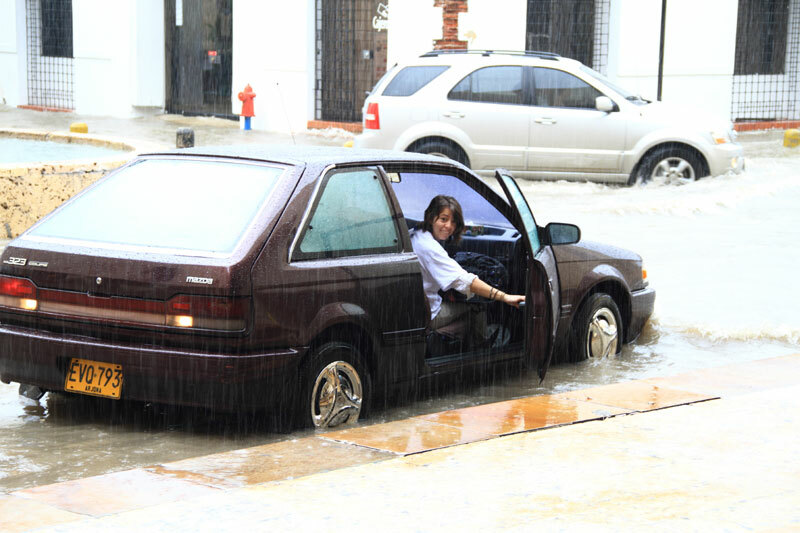 “In Cartagena, we have demonstrated that multilateralism works,” said Paula Caballero, the Colombian Ministry of Foreign Affairs officer who served as President of COP10. “The striking progress made in Cartagena demonstrates how by working together Governments can find common ground on issues that have confounded agreement for well over a decade. Cartagena has given to the global community a model for achieving sustainable development in the field of waste management,” said Jim Willis, Executive Secretary of the Basel, Rotterdam and Stockholm Conventions. The agreement on the Ban Amendment capped a week of negotiations between the Conference’s 700 participants. In addition to the CLI decision, the Conference in Cartagena also adopted Strategic Framework for the implementation of the Convention over the years 2012-2021, which sets out a vision, guiding principles, strategic objectives, means of implementation, and indicators of achievements. The Strategic Framework aims at strengthening the environmentally sound management of such wastes as a contribution to promoting human health, sustainable livelihoods, and eradicating poverty. Technical Guidelines were adopted on co-processing of hazardous wastes in cement kilns, environmentally sound management of mercury wastes, and environmentally sound management of used tyres, and further work was mandated on additional guidelines. More than 25 separate decisions on matters as wide-ranging as compliance, financial assistance, private- public partnerships, and the role of the Regional Centres for Training and Technology. The Parties also adopted the Cartagena Declaration on prevention and minimization of hazardous wastes. The declaration complements the Strategic Framework in determining the work under the Convention in years to come. It reaffirms that the Basel Convention is the primary global legal instrument for guiding the environmentally sound management of hazardous and other wastes and their disposal, including efforts to prevent and minimize their generation, and efficiently and safely manage those that cannot be avoided. The declaration also calls for the creation of a global methodology for accurate measurement of national waste generation. This would provide a means of gauging national efforts to make progress in waste prevention. The Cartagena meeting was the last of three related conferences of the Parties to the major chemicals and waste global treaties held in 2011. The parties to the Stockholm and Rotterdam conventions had met in April and June 2011, respectively. Decisions on synergies between the three conventions taken at the earlier meetings depended on the concurrent agreement of COP10. The Basel Convention´s Parties adopted a substantially identical decision enhancing cooperation and coordination among the Basel, Rotterdam and Stockholm Conventions and agreed on joint activities in the synergies part of the 2012-2013 work programme. 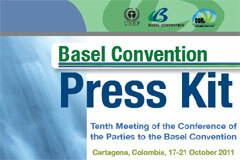 The 10th meeting of the Conference to the Parties to the Basel Convention was held from 17–21 October 2011. The eleventh meeting of the Conference of the Parties will be held in Geneva, Switzerland, in 2013. Mr. Franz Perrez (Switzerland) was elected to serve as President of the eleventh meeting of the Conference of the Parties. The 1989 Basel Convention on the Control of Transboundary Movements of Hazardous Wastes and their Disposal is the most comprehensive global environmental treaty dealing with hazardous and other wastes. It has 178 members (Parties) and aims to protect human health and the environment against the adverse effects of the generation, management, transboundary movements and disposal of hazardous and other wastes. The Basel Convention has two pillars. First, it regulates the transboundary movements of hazardous and other wastes. Second, the Convention obliges its Parties to ensure that such wastes are managed and disposed of in an environmentally sound manner. To this end, Parties are required to prevent or minimize the generation of wastes at source, to treat and dispose of wastes as close as possible to their place of generation and to minimize the quantities that are moved across borders. Strong controls have to be applied from the generation of a hazardous waste to its storage, transport, treatment, reuse, recycling, recovery and final disposal. The Conference of the Parties is the supreme decision-making organ of the Basel Convention. It meets every other year to discuss programmatic and budgetary issues for the next biennium. The Ban Amendment was adopted in 1995. Entry into force of the amendment had been mired in a controversy over the number of ratifications by Parties needed to bring this about. In the intervening decade, the quantity of transboundary movements of hazardous wastes has increased. A growing share of the international trade in hazardous waste is believed to lie outside of the framework of environmentally sound management. Trade in hazardous waste has grown significantly between developing countries, a trend unforeseen when the Convention was adopted more than two decades ago. Such trade is not addressed by the Ban Amendment. Recent years have seen efforts under the Basel Convention to develop a global strategy for environmentally sound waste management. In 2002, UNEP has established under the Basel Convention a partnership addressing the environmentally sound management of used and end-of-life mobile phones, the first of several strategic partnerships in different areas of waste management. In 2008 an additional partnership - the Partnership for Action on Computing Equipment (PACE) - was launched on used and end-of-life computing equipments. In these partnerships government representatives work together with the manufacturers, recycling industry, academic institutions and public interest NGOs. The Basel Convention has 14 Regional and Coordinating Centres, with one or more operating on every continent. The Centres develop and undertake regional projects, and deliver training and technology transfer for the implementation of the Convention under the direction of the Conference of the Parties and of the Secretariat of the Convention. The Cartagena meeting was held under the theme “Prevention, minimization and recovery of wastes”. 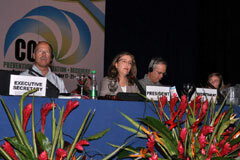 It marked only the second time the Conference of the Parties has been held in the Latin American and Caribbean region. The first meeting of the Conference of the Parties to the Basel Convention was held in Piriapolis, Uruguay, in 1992. The United Nations General Assembly has declared 2011 to be the International Year of Chemistry. Basel Convention Regional Center for Central America and Mexico (BCRC – CAM), Cartagena de Indias, Colombia (21 October 2011) – Destroying large banks of ozone-depleting substances (ODS), harmful to the earth’s atmosphere, together with persistent organic pollutants (POPs), damaging to human health and the environment, are the twin aims of a unique regional partnership launched on 21st October 2011 in Cartagena de Indias, Colombia. This initiative is supported financially by Norway and Switzerland. Central American leaders coordinating destruction of ozone-depleting substances and persistent organic pollutants announced two national pilot projects to help meet the challenge of collecting and destroying mounting stocks of chemicals and wastes in the region, on the closing day of the 10th meeting of the Conference of the Parties to the Basel Convention. 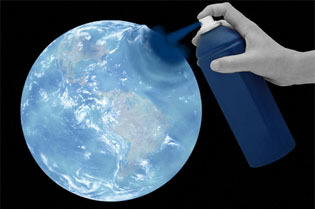 The Central American initiative will start with the above mentioned two national pilot destruction projects and then expand into other four Central American countries, collecting and destroying ODS and POPs and reducing ODS emissions, which could damage the ozone layer and increase climate change, while at the same time cleaning up POPs. Thus, six Central American countries will be cleaned of these substances: Costa Rica, El Salvador, Guatemala, Honduras, Nicaragua and Panama, based on the feasibility assessment which is currently under preparation. It will evaluate conditions for possible coordination with other POPs disposal procedures. Cost analysis studies will be carried out to ensure that the collection, transportation and destruction can take place in an economical, as well as in an environmentally sound manner, according to procedures approved under the Montreal Protocol on Protection of the Ozone Layer, the Basel Convention on Control of Transboundary Movements of Hazardous Wastes and their Disposal, and the Stockholm Convention on Persistent Organic Pollutants. This initiative will provide free-of-charge technical and financial support for the environmentally sound destruction of ODS and POPs to motivate holders of these substances to stop releasing them to the environment. “To overcome the difficulties faced by Parties in the identification of ODS banks for destruction and then ensure the ultimate destruction of these harmful substances, countries need new approaches. This groundbreaking project may set a precedent for future initiatives,” said Marco Gonzalez, Executive Secretary of the Vienna Convention and Montreal Protocol on Substances that Deplete the Ozone Layer. “Having a joint approach to ODS and POPs destruction provides a highly cost-effective model which can be shared and replicated in other regions,” said Jim Willis, Executive Secretary of the Basel, Rotterdam and Stockholm Conventions. “By promoting synergies between three international treaties and regional and national partners, the project will deliver concrete benefits to the economic and environmental health of the region and the globe,” he concluded. “The solution is to find ways to encourage, finance, and streamline shipment of ODS and POPs to safe destruction without opening loopholes that would allow the unsafe or undesirable shipment of other toxic and hazardous substances and wastes,” Mr. Araujo said. Experts from three multilateral environmental agreements – the 1985 Vienna Convention on the Protection of the Ozone Layer and its 1987 Montreal Protocol on Substances that Deplete the Ozone Layer, the 1989 Basel Convention on the Control of Transboundary Movements of Hazardous Wastes and their Disposal, and the 2001 Stockholm Convention on Persistent Organic Pollutants – have joined in support of the initiative. The initiative sets an example of synergies between the multilateral environmental agreements and regional and national actors. It will encourage national coordination efforts and help reduce costs of implementation of the treaties by preventing duplication of work. Initiative organizers underscore the urgency and relevance of this effort, given the higher cost effectiveness of a coordinated ODS and POPs destruction, current delays in preparing ODS inventories and facilities that can destroy ODS banks in the Central American region. The initiative results can also be replicated in other regions of the world. The initiative is organized and managed by the Basel Convention Regional Centre for Central America and Mexico (Centro Regional del Convenio de Basilea para Centroamérica y México, BCRC-CAM) in El Salvador. The initiative is supported by the Norwegian Ministry of the Environment and the Swiss Federal Office for the Environment, with special technical support provided by the Netherlands Ministry of Defense, United States Department of Defense, the United States Environmental Protection Agency, UNEP, Refrigerant Reclaim Australia, Hortitectnia, and the National Institute for Advanced Science and Technology of Japan. Institute for Governance and Sustainable Development is providing legal, capacity building, and networking support to identify and resolve barriers to the desirable cross-border shipment of ODS and POPS for destruction. The goal is to fully satisfy the norms of prior informed consent, while supporting sustainable solutions to chemical management. “Pilot destruction of ODS and POPs and Legal Analysis of Feasibility of Transboundary Movements within Central American countries”, financed by Norway, which will produce calibrated protocols for the destruction of ODS and POPs banks based on pilot destructions, and a legal analysis on the feasibility of intraregional transboundary movements of ODS and POPs. It seeks the use of existing capacities for the destruction of ODS that are not currently available in many Central American countries. In turn, the new Central American initiative will provide information on existing ODS and POPs banks and alternate technologies and costs for their destruction. The initiative will seek synergies with related efforts in the region (e.g. Reduction of Chemical Runoff in Agriculture and Tourism (REPCAR II), remediation activities in coordination with the BlackSmith Institute). The Basel Convention was drafted and adopted when a tightening of environmental regulations in industrialized countries in the 1980s stimulated irresponsible shipping of hazardous waste to developing countries and to Eastern Europe. The Convention established a framework based on “prior informed consent,” for controlling movements of hazardous wastes across international frontiers. The Convention mandates Parties to reduce the hazardous wastes generated and promote environmentally sound management (ESM); restrict transboundary movements of wastes except where these agree with ESM principles and ensure ESM of wastes as close as possible to where they were generated. Organized under the theme “Prevention, minimization and recovery of wastes”, the Tenth Meeting of the Conference of the Basel Convention is being held at the invitation of the Government of Colombia in Cartagena de Indias, Colombia, from 17 to 21 October 2011. Eight hundred delegates and observers from over 150 countries are attending the meeting. The Stockholm Convention is a global treaty to protect human health and the environment from chemicals that persist in the environment for long periods, become widely distributed geographically, bioaccumulate in humans or wildlife, and have adverse effects to human health or to the environment. The Convention requires Parties to take measures to eliminate or reduce the release of POPs into the environment. The Vienna Convention and its Montreal Protocol protects the Earth against harmful ultra violet radiation by phasing out the production and consumption of nearly 100 ODS once used in over 250 industrial, military and consumer sectors. ODS were once widely used for health (medicine & sterilization), fire protection (food processing, weapons), electronics and aerospace (solvents), energy efficiency (insulating foam), food preservation (refrigeration and food freezing), comfort (air conditioning), convenience (aerosol deodorant and hairspray), and more. This week, there are a number of items on your agenda that will be crucial for determining the strategic future of this convention - in particular the New Strategic Framework and the Swiss-Indonesian Country-Led Initiative (CLI). First of all, I would like to start by warmly thanking the Government of Colombia for hosting and supporting the preparations of this meeting in this beautiful city of Cartagena de Indias. These two agenda items can be mutually supportive and offer a unique opportunity to find a path forward on the Ban Amendment. Together with a path forward on the entry into force of the Ban Amendment, there is a need to strengthen the regime to balance obligations and commitments for generators and exporters as well as for importers and waste processers. Upstream, there must be a commitment to minimizing and preventing the generation of waste, in keeping with the Convention, while downstream there is a need for rigorous environmentally and socially responsible waste management. It is my sincere hope that this week you can find a compromise that would allow the Ban Amendment to come into force for those countries who wish to adhere to it, but also moves forward in establishing a regime for countries who wish to trade in waste to ensure the minimization of health and environmental impacts, ensuring adequate social and labor conditions and creating new economic opportunities. Another important area of work is that of activities linked to legal, compliance and governance matters. The pursuit of the Basel Convention activities in the areas of national legislation, national reporting, enforcement to mitigate illegal trafficking, technical assistance or international cooperation and coordination with Basel partners, remains fundamental. All of these activities will not be possible without the necessary training on waste management and disposal at national level. In this view, synergistic and regional capacity building activities through projects and programs are critical. In reflecting about the theme of the COP on ‘waste prevention, minimization, and recovery’, I would like to note that next year we will be celebrating the 20th anniversary of the Rio Conference on Environment and Development and the 40th anniversary of the 1972 Stockholm Conference on the Human Environment. As we approach the landmark year of 2012 and take a look at what we have achieved in the area of waste management, it is clear that there is still a lot of work ahead of us, especially with regards to strengthening the links between waste management and the achievement of the Millennium Development Goals and human health and livelihood. These links are crucial for increasing the global recognition and interconnectivity of waste-related issues. Consideration of waste management issues as an integral part of the life-cycle of chemicals as a result of the ongoing synergies process across the three conventions has no doubt contributed to strengthening their visibility by including waste-related issues in a much larger multi-sectoral context. Delivering as one: through effective coordination of activities with relevant partners. Delivery at all levels: through the effective delivery of activities at the global, regional and national levels. Over a year ago in Bali Parties to the Basel, Rotterdam and Stockholm Conventions adopted a ground breaking framework for the achievement of enhanced coordination and cooperation among the conventions. Proposals on how to enhance cooperation and coordination among the three conventions as they relate to support to implementation, managerial functions, services, synchronization of budget cycles, audits and review arrangements have been put on the table. Your commitment to these issues will make it possible to review actions and complete a cycle of synergies-related actions that will facilitate the way forward for further cooperation and coordination on the sound management of chemicals. The results of the synergies process are coming into fruition and we are seeing a gradual transformation of the way the international community and the three convention secretariats are managing their response to the challenges and the opportunities presented by hazardous chemicals and wastes, while fully respecting the legal autonomy of each convention. The courageous steps taken by Parties in Bali need now to be followed by a continued solid and stable dedication to the process and its implementation. Only then can the full benefits be achieved. But how do we make this happen without a financial mechanism? UNEP is supporting a country-led consultative process on financing options for chemicals and wastes. The purpose of this process is to review the current situation with regard to financing for chemicals and hazardous waste management at all levels and to identify synergistic proposals for improving it. The last meeting on this process has just come to a conclusion in Bangkok two weeks ago. You will have the opportunity to be informed about the outcomes of this process during this week during one of the side-events that UNEP is organizing. In relation to the latter, I would like to take this opportunity to thank all Governments, private sector, civil society and intergovernmental organizations that have participated in the consultative process, with a great sense of engagement which demonstrated the importance they attach to identifying tracks on how to work towards an integrated approach to financing chemicals and wastes management. I am hopeful that the outcome of this process will help you in the coming days when discussing implementation, legal, compliance and governance matters under item 3 of the agenda. UNEP, through its Evaluation and Oversight Unit, has engaged in an evaluation of the synergies process among the three chemicals and wastes conventions. This assessment, combined with the recommendations of the consultative process on financing options for chemicals and wastes, and the recent mandate of the UNEP Governing Council to continue exploring synergies in the larger chemicals and wastes cluster come at a critical time in the history of the chemicals agreements. All these encouraging results of the reforms in the chemicals and waste cluster come a few months before governments meet in Rio to start negotiating on the issues of a green economy in the context of sustainable development and poverty eradication; and the institutional framework for sustainable development. It is my hope that this week’s deliberations will contribute in many ways to the World Conference next year in Rio. The disintegrated and fractured nature of the environmental governance landscape has undermined the effectiveness of the overall sustainable development effort and led to duplication and a less than efficient use of scarce financial resources. With your actions this week, we can contribute a working example of ‘Delivering as One’ in international environmental governance. UNEP is committed to supporting you, the Parties to the Basel Convention, to face the many challenges you have in front of you. Under the capable guidance of your COP President, I am sure that you will have a successful meeting with long-lasting impacts and results. I look forward to joining the meeting this Friday. Geneva (5 October 2011) – The member-Governments of the Basel Convention on the Control of Transboundary Movements of Hazardous Wastes and their Disposal will meet at the Cartagena de Indias Convention Centre, Cartagena, Colombia, from 17 to 21 October 2011 for the tenth meeting of the Conference of the Parties to the Basel Convention, hosted by the Government of Colombia. The Conference is dedicated to the theme “Prevention, minimization and recovery of wastes”. The Basel Convention is the most comprehensive global environmental treaty dealing with hazardous and other wastes. It has 178 members (Parties) and aims to protect human health and the environment against the adverse effects of the generation, management, transboundary movements and disposal of hazardous and other wastes. Government representatives in Cartagena will investigate ways in which the Convention could help turn wastes into valuable resources, so as to create business and job opportunities, while protecting human health, livelihood and the environment. Turning wastes into valuable resources is currently one of the largest unaddressed challenges facing the international waste agenda. Electronic wastes offer a particularly striking example, as they often contain valuable metals which are currently neither collected for recycling nor entering those recycling streams that are capable of recycling them efficiently. End-of-life recycling rates for precious metals from electronics are estimated to be at or below 15% (UNEP, 2011). Yet 30 obsolete mobile phones contain the same amount of gold as one ton of mined ore, in addition to other valuable metals, including cobalt (in Li-Ion batteries), copper, palladium and silver. Smelting processes, which separate metals from other materials, may release metal fume and metal oxide particulate, dioxins and furans, exposing workers and downwind communities unless the emissions are controlled. These releases can be controlled through properly engineered processes and emission control systems, but require environmentally sound management, a key pillar of the Basel Convention. Uncontrolled incineration or land filling of end-of life mobile phones therefore makes neither environmental nor economic sense. Properly managed recovery can extract these metals in ways that protect the environment and human health, while promoting sustainable livelihoods for workers engaged in recovery operations. The Conference will also look at ways to prevent and minimize wastes, considering it as part of the life cycle of materials, as an essential component of the concept of sustainable production and consumption. The Conference in Cartagena will consider a new strategic framework to steer development of the Convention during the next decade. Parties will examine proposals tabled by the Governments of Indonesia and Switzerland for a way forward on the Ban Amendment, which would ban trade in hazardous wastes between Organization of Economic Cooperation and Development (OECD) countries and developing countries which are party to the Amendment. The proposals are the product of a country-led process that was transparent and invited input from all interested parties and stakeholders. Trade in hazardous wastes has grown significantly between developing countries, a trend unforeseen when the Convention was adopted more than two decades ago. Such trade is not addressed by the Ban Amendment, which was adopted in 1995 and has 70 Parties. Due to a long-standing dispute over how to calculate the requisite number of ratifications needed which has defied resolution by consensus, the Amendment has yet to enter into force. In the intervening decades, the quantity of transboundary movements of hazardous wastes has increased. Experts estimate that by 2018 the quantity of e-waste generated in developing countries will exceed the amount generated in OECD countries. A growing share of the international trade in hazardous waste is believed to lie outside of the framework of environmentally sound management. “Today, the protection of vulnerable countries remains as important as ever. Yet, the picture of trade in wastes has moved on, with transboundary movements of waste between developing countries having become a major factor,” said Jim Willis, Executive Secretary of the Basel, Rotterdam and Stockholm Conventions. The 1989 Basel Convention on the Control of Transboundary Movements of Hazardous Wastes and their Disposal has two pillars. First, it regulates the transboundary movements of hazardous and other wastes. Second, the Convention obliges its Parties to ensure that such wastes are managed and disposed of in an environmentally sound manner. To this end, Parties are required to prevent or minimize the generation of wastes at source, to treat and dispose of wastes as close as possible to their place of generation and to minimize the quantities that are moved across borders. Strong controls have to be applied from the generation of a hazardous waste to its storage, transport, treatment, reuse, recycling, recovery and final disposal. Recent years have seen efforts under the Basel Convention to develop a global strategy for environmentally sound waste management. This included support to the launch of the Partnership for Action on Computing Equipment (PACE), the first of several strategic partnerships in different areas of waste management. For further information on the recovery of valuable metals from end-of-live electronic products, see Recycling Rates of Metals – A Status Report, Appendix E. Review of Precious Metals Recycling Statistics (UNEP, International Resource Panel, 2011). Download this press advisory in Spanish. Basel COP 10: Promoting prevention, minimization and recycling of wastes as a concrete input to Rio 2012? Under the theme “Prevention, minimization and recovery of wastes”, the tenth meeting of the conference of the Parties to the Basel Convention presents a unique opportunity to present to the Rio+20 conference with a concrete example of how transformative environmental action can deliver important economic and social outcomes. If managed in an environmentally sound manner, the extraction of valuable secondary raw material from wastes can create green business opportunities and decent jobs for millions of often young people throughout the developing world, thus playing a part in eradicating poverty. For the complete article, see the Basel Convention bulletin (September 2011).